A beautiful home starts with beautiful light. Whether you want to brighten up your rooms, allow just enough light to read by, or enjoy complete darkness for an afternoon movie, you can get the most out of your home with motorized shades and blinds. Adding smart shading to your space and automation system is a great way to save energy, enhance privacy, and reduce the impact of UV rays on your furnishings. In this blog, we’ll explore some of the great options you have when it comes to a motorized shading system. Keep reading to learn more. Motorized shades are perfect for just about any project. It doesn’t matter if you’re adding them to your existing home or including them as part of new construction, install and integrate them as part of a smart home system or a standalone component. For new builds, enjoy the reliability and durability of a hardwired system. For instance, Lutron’s Sivoia QS can operate with low voltage electrical wiring and uses common communication language that makes it compatible with most smart home systems. Users enjoy a variety of appealing roller options, including drapes and blinds, while mechanical components like motors and wires remain hidden from view. If you’re adding shades to an existing room, you can use Sivoia QS wireless, which offers the same level of compatibility but operates on a radio frequency that won’t interfere with your Wi-Fi signal. Finding the right control option for your home can be daunting, but Lutron makes it simple. From on-wall keypads to in-app controls, you can take advantage of your hardwired or wireless system with ease. Keypads look and feel similar to light dimmers or switches, but offer a high level of control over your shades as well. Featuring individual up and down controls, as well as pre-set, engraved buttons for your most frequent needs, you can enjoy a beautiful, brushed metal look for any room. Plus, keypad buttons subtly illuminate so you never have trouble finding the command you need in the dark. Other control options include the Lutron App, which places digital controls directly onto your smartphone or tablet. You can command your lights and shades with a single interface, which allows you a greater variety of options. Additionally, you can integrate your motorized shades with a total smart home solution, like Savant. With a single controller, you can use your shades, lights, AV, comfort, and security systems. Plus you can use timers, sensors, and other components to enjoy hands-free command of your spaces. 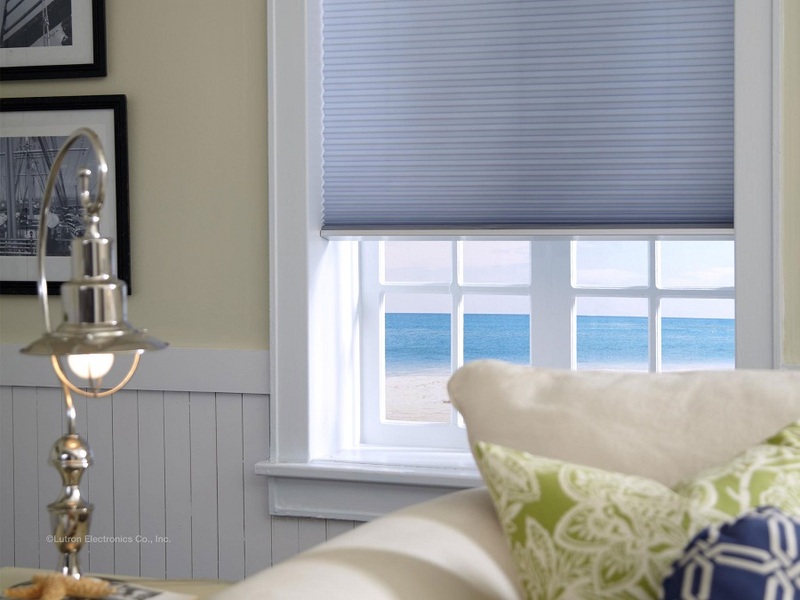 Want to learn more about your control options for motorized shades and blinds? Click here to get started.